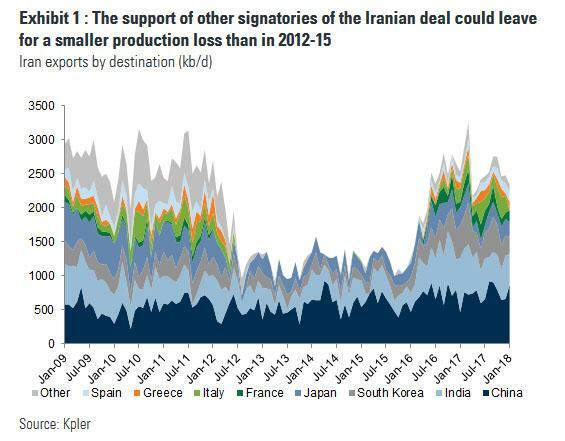 As Goldman explains this morning, the final impact on Iran oil will likely be somewhere inbetween, with the ultimate impact on Iran production rather negligible for the foreseeable future. The reason for that is that following the announcement, other signatories of the deal reiterated their support for the agreement as well as their desire to revisit it. President Macron said that France, Germany and the UK regretted the decision and the EU vowed to uphold the Iran nuclear accord. Russia announced that the US alone would not be able to overturn the deal and its Deputy Foreign Minister said it was willing to support France's proposal for new negotiations. At the same time, Iran announced that it will remain in the nuclear deal and will start talks with European nations, China, and Russia. For Iran's clients what happens this time will likely echo the last episode earlier this decade, when Iran was also sanctioned by the US. Back then countries were given exemptions by the U.S. - reviewed every 180 days - if they “significantly” reduced imports from the Islamic Republic. While a specific quantity of reductions that would make buyers eligible for waivers wasn’t announced, a slew of nations including China, India and South Korea received them. Meanwhile, nations such as China, India and Turkey will most likely oppose outright the U.S. move and keep current levels of Iranian crude purchases; still some smaller US allies including South Korea may comply, unless they get a waiver, over concerns of they could lose a security umbrella against North Korea, according to MUFG Bank. factors. 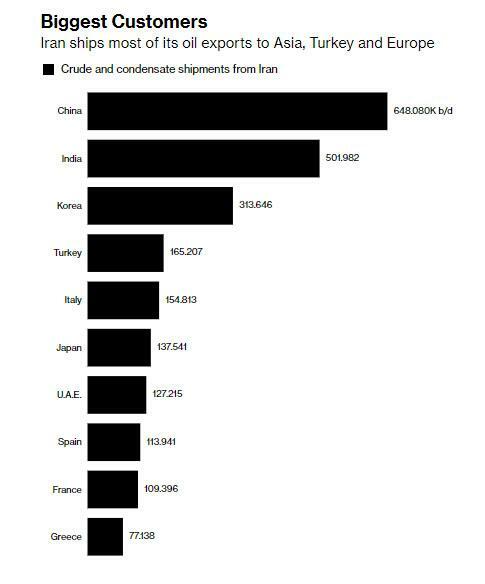 First, the US could release SPR barrels to help compensate for lost Iranian production, with Iran demand also set to decline due to the sanctions. For example, yesterday also saw a military confrontation between Israel, Syria and Iran. 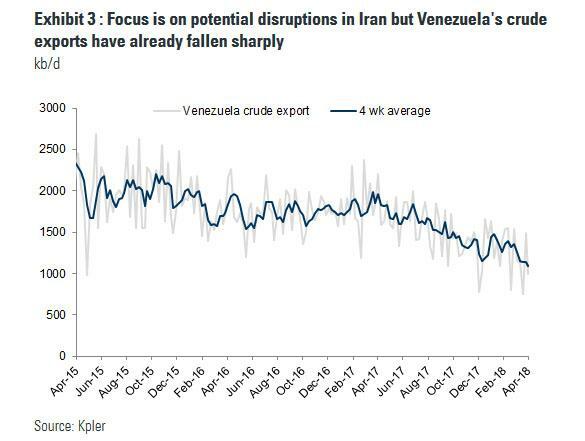 The situation in Venezuela has already led to a 600 kb/d decline in production over the past six months (more barrels than presently at risk in Iran), with no sign of any slowdown in production declines. In fact, the seizure of Venezuelan assets this week has lead to a stall in local exports. In addition, Vice President Mike Pence announced renewed sanctions on Venezuela yesterday while asking that Venezuela suspend its May 20 presidential elections. To summarize, while Goldman does not believe that the Iran deal alone will result in production declines, the bank concludes that elevated oil geopolitical risks exacerbate the upside risks to Brent forecasts and reinforce its view that oil price volatility will continue to increase.